Love is in the air this Valentine's Day with Carnation! Be the first to try our new and exciting Peanut Butter Fudge! In just 3 simple steps you will have a scrumptious treat perfect to share with that special loved one. Not only do we have this tasty new recipe, but we have brought together some of Carnation’s most romantic recipes. These range from deliciously sweet cupcakes, to mouth-watering Hot Choc Fondant and Caramel Fondue. These quick and easy recipes ensure you have time for a romantic evening. Fall in love with our delicious new Carnation recipe. 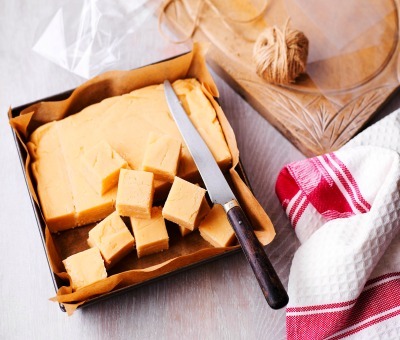 We are pleased to share our Peanut Butter Fudge recipe, which is a twist on our Ultimate Fudge. This recipe can be made for any sharing occasion and it can become the perfect gift on this romantic day! This divine mixture of refreshing strawberries and raspberries, crunchy meringue and mouth-watering whipping cream will melt everyone’s hearts this Valentine’s Day. Try the recipe today and impress your loved ones! Not only are these cupcakes a treat for everyone’s eyes, but the scrumptious frosting and delicious chocolate mixture never fail to impress. Also they only take 30 minutes to make! On Valentine’s Day why not try this recipe, with its gooey, chocolatey centre? It can be a romantic way finish to a dinner or a delicious way for your entire family to celebrate Valentine’s Day. What is more romantic than a skewer with strawberries, kiwi and pineapple dipped in a delicious caramel dip? We know, sharing the skewer!